Provide comfort for the family of Beata Chavez with a meaningful gesture of sympathy. Beata(Betty) de Vera Chavez, beloved wife of Jose(Pete) Chavez Jr. She was also the eldest daughter of the late Juan de Vera and Mercedes Sus de Vera. Her brothers Atty. Luis de Vera(deceased), Ramon de Vera, Agapito de Vera(deceased), Alberto de Vera, Dr. Manuel de Vera, Celso de Vera(deceased). Her sisters Valentina de Vera Gerona, and Emma de Vera Gerero. 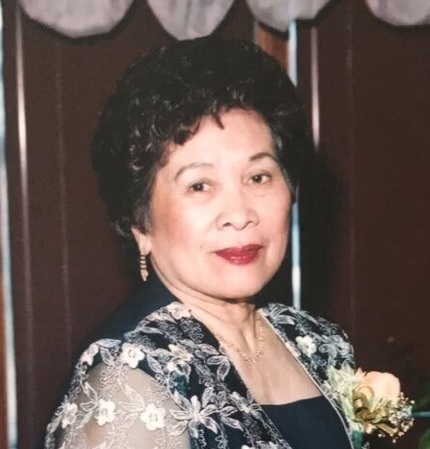 She passed away peacefully at Seven Oaks General Hospital on December 24, 2018 at the age of 86. She was survived by her husband Jose(Pete) Chavez Jr. Pete and Betty were married for 64 years. She will be lovingly remembered by her son Romy Chavez, his wife Mercedes(Ehden), Their son Rhoden Chavez, his wife Sounaly and their children; Owen, Asher and Arya, Another son Chris Chavez and his son Carson, also son Romeo Chavez Jr.(Ton) and his wife Gizelle. She was predeceased by her son Ramiro Chavez. She was also survived by her son Jose Rey(Uyo) Chavez III (Philippines) his wife Melinda(Melin) and children Christian James, and Christin Joy and Chiara. She will be lovingly remembered also by her daughter Maria Socorro(Maricor) Proctor her husband Bayne and children Ian and Christy. She was survived also by her grandson Jeff Amio(nephew of Ehden) and his wife Maria Asuncion(Gigi) and son Jaypee. We thank all the home care personnel that have taken care of her for the last few years. Also we would like to thank all the healthcare personnel from the 3rd floor unit 4 of Seven Oaks General Hospital. Lamay will be held at Mosaic Funeral Chapel at 1839 Inkster Blvd. Winnipeg. Manitoba on Friday, January 4, 2018 @ 6:00pm to 12:00am. To send flowers to the family of Beata de Vera Chavez, please visit our Heartfelt Sympathies Store. We encourage you to share any memorable photos or stories about Beata. All tributes placed on and purchased through this memorial website will remain on in perpetuity for generations. Provide comfort for the family of Beata de Vera Chavez by sending flowers.